Since I'm leaving for weekend an will be offline anyway, I thought I could as well extend the deadline for a day. So I'm shouting out to all of the hesitant AGSers out there: perhaps it's time to have a second though about it and to show us your interpretation of what coexistence could look like? Nursery rhyme of the day: don't hesitate before it's too late! SHOW SOME PERSISTENCE FOR COEXISTENCE! All right folks, the time's up! Thanks to all the participants for all these wonderful, highly co-existential entries! Now it's time to vote for your favorite example of coexistence. "Someone ventured into the wrong cave and returned in coexistence with an alien species. Omnomnom." 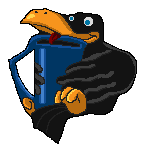 "Where-ever Quoth the Raven is, his Big Blue Cup* is never amiss! And that is how they co-exis(t)." "A truce in the Battle of the Sexes." 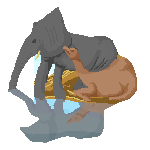 "A rhino with an oxpecker on it as an example of coexistence in mutualism." "the true nature of beings reflects in their coexistence as they always coexist with their reflection..."
"It's a hermit crabbish creature with carnivorous worms living in its shell." Voting ends May 23rd (Thursday)! *** It seems like selmiak forgot to meet the additional requirement and didn't describe his picture (busy in the Monster's workshop, I suppose? ). So selmiak, it would be cool if you could make up for it while the voting lasts I'll edit this post as soon as I have the description. This is a hard one. I wish I had more than one vote. I love waheela's entry due to its awesome shading. jwalt's is great for what he did with the girl's arm despite the difficult shape. In the end, I'll have to go for selmiak's for its brilliant take on the shape and since it took me forever to find the triangle in his piece. Edit: If the updated voting scheme is agreed on, my second vote goes to waheela (2 points) and the third to jwalt (1 point). If not my first place remains as it was. Terrific entries. I'm going to have to go with Ghost for this one. I thought all of these were great. In the end, it was Selmiak that left me with that "wow!" feeling. Oh man! So many cool entries and only ONE VOTE? I like both jwalt and waheela's entries a lot. Can't I vote a tie? No? Ah well. I think jwalt's use of the shape is really great, and it fits the theme so nice, so: My vote for jwalt! That's a hard decision as all entries are great. I vote for waheela because I like the coloring best. It's possible to use "too much" and "coffee" in one sentence? Lovely entries! And a hard decision. My vote goes to Selmiak because I love everything about the entry: colors, composition and especially the reflection. A meeting of the minds, coexistantly speaking. Again, this is not an entry. All right, the voting is over, but we have a situation here. A so-called 'coexistential paradox', in which too many organic beings (here: FOUR AGSers) are supposed to coexist with ONE non-organic thing (in this case, a silver medal). I really want to give an award to everyone of you guys***, but four ex aequos is a bit too many, and I don't want to devalue AGS silver reserves (think about the wider scale economic repercussions here!). Also, that would leave bronze medal needless. So, after I've belatedly read Cerno's suggestions about the new voting system (wish I'd read them BEFORE voting, my bad), I've decided to organize the voting again. Yeah, I know, I don't like it either. Apologies for inconvenience, but we really do have a kind of impasse here. This time, we'll do things like Baron did in last Writing Competition. 1. You must choose your three favourite examples of coexistence and rank them by preference. 2. The first in your list (which should be indicated as 1st) will be apportioned 3 points, the second (which should be indicated as 2nd) will be given two points, and the third (labelled 3rd) only 1 point. This means you have six points to award. Voting lasts till the end of week (till Monday, 00:01, time zone UTC +1). On Monday I'll count the totals and award the prizes. AND NOW, PLEASE CAST YOUR VOTE! *** There will be special commemorative badge for each participant to take. That's because I don't want the now-silver-medalists to go away empty handed when they'll lose the podium after the new voting ends. To tell you the truth I've intended to do that anyway when the competition was still running, because I liked how people have put some real effort here... and now I see jwalt even painted a second example of coexistence (out of competition) - how cool is that? Oh come on, just give everyone a silver medal, they all deserve it! No need to make it more complicated. Cat, that's actually a vote against voting! I tell you what. If there's more votes against voting, I'll do as you said. Majority will decide. Damn, I hate democracy. We should vote if we are willing to vote against the voting. Any votes? No? Toss the silver, says me. It is your competition and your rules. Awarding a bunch of Silvers would, incidentally, elevate Cerno, who now wears bifocals because of all the pixel counting he did during the course of the contest (and if my vote tally is correct), into a Bronze. Seems not voting is a good thing to do... Or not do? Now, I'm getting confused. As the one who proposed this voting scheme, I'll roll with whatever you guys decide. If you should agree to the voting scheme, may I suggest that everyone just updates their voting post to avoid confusion.